Launch vehicle, spacecraft, and solid rocket motor manufacturer Orbital ATK, along with Lockheed Martin, have successfully completed the Critical Design Review (CDR) of the Orion spacecraft’s Launch Abort Motor. Finished on Thursday, Aug. 6, the CDR allowed Orion to move one step closer to the day when it would send crews deep into space aboard the new Space Launch System booster. The “LAS”, as the abort system is known, uses solid propellant in the event of an emergency whenever astronauts are in the Orion. This emergency scenario includes when they are at Kennedy Space Center’s Launch Complex 39B during liftoff or on their way out of the atmosphere. Orbital ATK has developed methods in which to ensure that critical flight components are delivered on schedule. A fact highlighted by one of the company’s representatives. The Vice President of NASA Programs for Orbital ATK Propulsion Systems, Fred Brasfield, told SpaceFlight Insider: “We have a very disciplined management approach at Orbital ATK to ensure technical rigor, risk management, and to provide schedule margin. According to a statement issued by Orbital ATK, the LAS is capable of igniting within milliseconds and can accelerate to approximately three times the average acceleration of a drag race car to carry the crew module a safe distance from the primary rocket and debris field. The need for such systems became apparent on June 28 when a SpaceX Falcon 9 v1.1 rocket disintegrated some 139 seconds into flight. Fortunately, this flight was uncrewed, and no one was injured during the mishap. SpaceX is developing an abort system for the crewed version of Dragon as well. The CDR confirmed that the LAS met mission performance requirements. The system can now move on to full-scale fabrication, assembly, and testing. As is the case with most of ATK’s solid rocket systems, it will be checked out at the company’s facilities located in Magna and Promontory, Utah. Meanwhile, the composite case that comprises the container of the system will also be produced in Utah. It measures some 36 inches (91 cm) in diameter and is approximately 175 inches (445 cm) in length. The LAS attitude control motor, being built by Orbital ATK on a separate contract with Lockheed Martin, will be made in Maryland. In terms of maximizing the capabilities of any system designed to reach orbit, the vehicle and its related systems need to be as light as possible and yet still be able to lift heavy payloads of crews and cargo to orbit. Brasfield noted the efforts done by Orbital ATK to help achieve this. 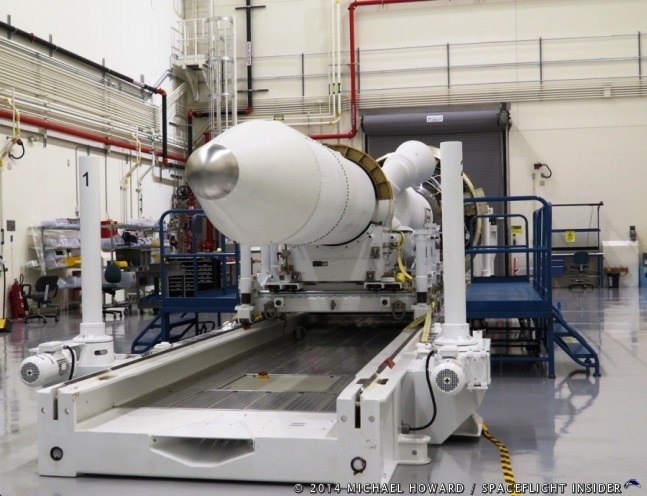 “We used optimization methods to reduce abort motor mass in order to provide our customers with a maximum thrust and minimum weight motor,” Brasfield said. During the early stages of LAS’ development, it was evident that a propellant with a high rate of burn would be required. This is necessary if the LAS would be able to pull Orion away from the SLS should the need arise. Such a propellant was selected, one that burns three times higher than similar propellants. The reason for this is the LAS alone weighs in at an impressive 16,000 pounds (7,257 kg). 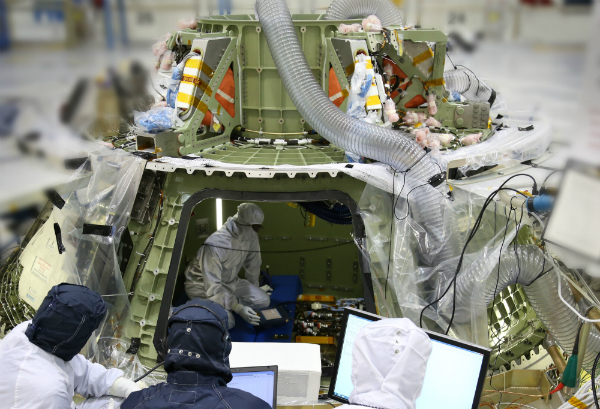 The Orion spacecraft meanwhile has a mass of some 46,848 pounds (21,250 kg). NASA documents state that the LAS can activate in just milliseconds – pulling the crew on board to safety. The LAS is made up of three rocket motors; the abort motor, attitude control motor and a jettison motor (which pulls the LAS away from Orion). At present, both the SLS and Orion are checking off milestones and remaining on track for a 2018 launch. That mission – like the Dec. 2014 first flight of Orion on Exploration Flight Test 1 – will be an uncrewed flight. That flight has been dubbed Exploration Mission 1 (EM-1) and will mark the first time that the massive new booster is sent aloft. 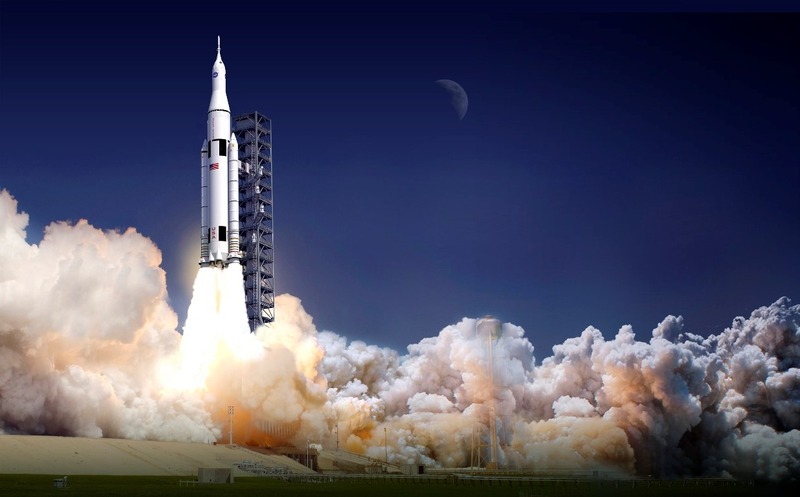 The SLS will be powered by four Aerojet Rocketdyne RS-25 engines. One of those engines is scheduled to carry out a hot-fire test on Thursday, Aug. 13, at NASA’s Stennis Space Center located in Mississippi. The booster also has upcoming avionics and controls testing at Marshall as well as another test of one of the five-segment solid rocket boosters during the Qualification Motor 2 (QM-2) test firing, which is currently scheduled to take place in 2016. I remember the Apollo escape system, man what a great design. is pre-programed directional attitude. what are the dimensions? this is really something. I worked for Boeing back in 1964 on the Apollo program at McCloud Facility.